Google Buzz is pretty cool, and I follow a couple of people who have been developing quite substantial conversation threads in Buzz (particularly Robert Scoble, who asks some good questions and gets a ton of answers). 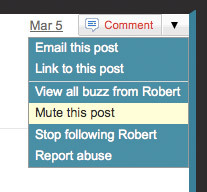 Click on the far-right top dropdown menu associated with each post and click on the “Mute this post” option. This will mute the post and keep it from showing up in your Buzz feed again. Note you need to have hotkeys enabled for your Gmail account for option 2 to work.